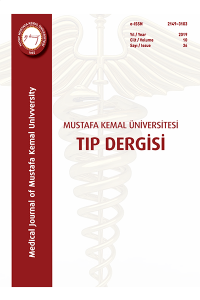 Medical Journal of Mustafa Kemal University is the official publication of the Hatay Mustafa Kemal University, Faculty of Medicine and published online three times a year. It is a national, periodic journal based on the principles of blind peer-review process. The languages of the Journal are Turkish and English. It publishes original researches, case reports, reviews and letters to the editor based on clinical or experimental studies in all areas of medicine. Manuscripts submitted for publication in the journal should be prepared in accordance with research and publication ethics. Manuscript Submission: All manuscripts should be submitted by online system of the Journal. Articles submitted in other forms will not be considered. All manuscripts submitted to the Journal are screened in terms of originality.